All this week players at NetBet Casino have the chance to win a share of £1,500 cash in the Super Lucky Year promotion. Simply play the qualifying slots and climb up the leaderboard. If on Sunday, 3rd January, you are in the top eight then you will win a cash prize. First prize is £500, second is £250, third is £250, fourth is £100, fifth is £100, sixth is £100, seventh is £100 and eighth is £100. The qualifying games are Super Lucky Reels, Diamond Wild, Ultimate Super Reels, Absolute Super Reels and Super Fast Hot Hot. Best of all, the slots are all linked to progressive jackpots so you could win a huge amount of money alongside the cash prize. 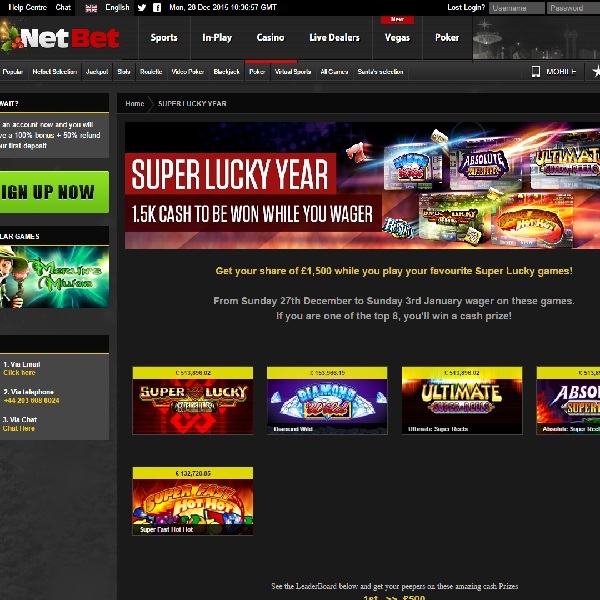 Don’t miss out on this great New Year’s opportunity, head over to NetBet Casino today and set the reels spinning.